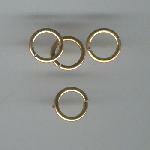 Jump rings are probably the most common finding found in earrings, bracelets and necklaces. To attach your pendant or charm to a chain just place in on a jump ring and close the jump ring. They can also be used to make chain and chainmaille weave designs. Oval jump rings have the advantage of keeping the opening away from the dangling pendant.